Wyoming is the most prolific coal-producing state in the United States, but in 2013, Wyoming coal production fell by 3 percent, making Fan’s research all the more timely. 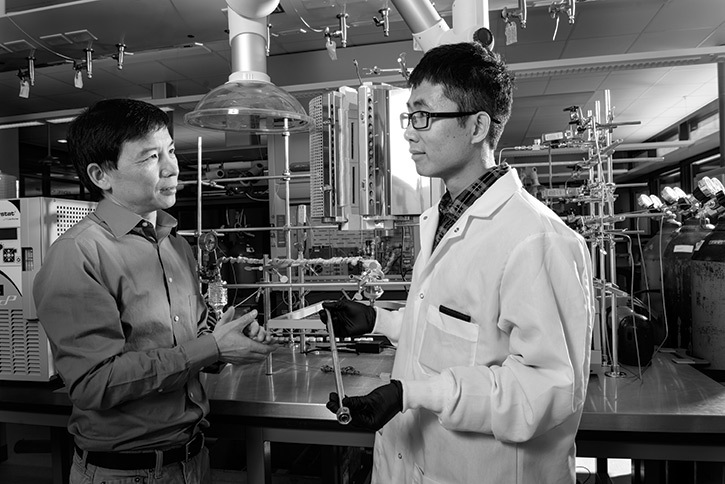 His main team members in the advanced conversion cluster include David Bell and Hertanto Adidharma from the Department of Chemical and Petroleum Engineering, and Yuan Zheng and Michael Stoellinger from the Department of Mechanical Engineering. Donations from Peabody Energy Inc. and Arch Coal Inc. were matched by the state to support this promising research. In addition, management of big data and the development and use of sophisticated high-fidelity computer-based simulation models is becoming increasingly important across a wide range of industries, such as the energy industry and advanced manufacturing. Thus, sustaining a world-class position in these areas aligns well with UW’s Tier-1 initiative. The cluster seeks to solve a multitude of fundamental and applied engineering problems, as well as sustaining excellence within the fields of atmospheric research and developing new opportunities for creating wealth from natural resources, including minerals, wind and water. The team includes Michael Stoellinger from the Department of Mechanical Engineering, Xiaohong Liu from the Department of Atmospheric Science, and Liqiang Wang and Amy Banic from the Department of Computer Science. Team members already receive funding from the DOE, NASA, the U.S. Department of Defense and the National Science Foundation, and formal dialogues are underway with IBM to collaborate in a number of fields, including discussions on the potential to set up a center of excellence at UW in computational modeling and simulation. There is also potential to generate interest from other major players such as Intel, Nvidia, Microsoft, Google and other corporations that have a stake in scientific computing. About 50 to 70 percent of the original oil remains stranded in Wyoming’s aging fields, and enhanced oil recovery methods have the potential to retrieve 5 to 15 percent of that oil. 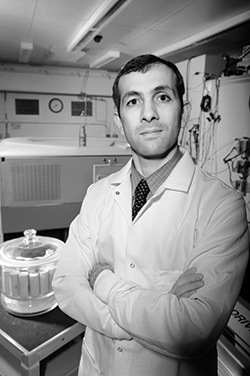 Piri, an international leader in the field, will lead his team as they leverage the unique technologies and equipment at UW to examine oil and gas flow in unconventional reservoirs to discover the fundamental driving mechanisms that impact yield and output. “The establishment of improved understanding of flow and transport in these systems will lead to the development of new hydrocarbon recovery techniques,” Piri says. Principal team members include Lamia Goual and Saman Aryana from the Department of Chemical and Petroleum Engineering, and Dario Grana from the Department of Geology and Geophysics. Their research will include a new permeability simulator model for improving uncertainty forecasting of oil and gas reservoir rock yields, improved reservoir characterization methods that relate static and dynamic geo-physical measurements, a new fundamental pore-scale model (atom level and upwards) for establishing oil and gas flow in reservoir rock, and screening of new surfactants and nano-fluids to stimulate oil and gas productivity. Piri’s research has already resulted in significant collaborations with private industry, including financial support from Hess Corp., Halliburton Co., Saudi Aramco, Total S.A. and Encana Corp.